(March 24th 2014) - Archipelago International is set to expand its flourishing Aston brand with the opening of Aston Belitung Hotel on the island of Belitung, situated off of Sumatra's east coast. With a soft opening in early January 2014 and the ceremony was opened by Ministry of Tourism and Creative Economy Mrs. Mari Elka Pangestu and Bangka Belitung’s Governor Mr. Rustam Effendi, the hotel was conceptualized to support Belitung’s development, providing international standard accommodations and conference facilities to the city’s growing commerce. Belitung is renowned for many things, namely its beautiful beaches, unique landscapes, pure white sandy bays dotted with dramatic granite boulders and the crystal clear sea water that surrounds it. After serving as the location for the famous Indonesian movie, Laskar Pelangi, Belitung has become known for its idyllic location, as well as its production and distribution of pepper and tin. The main tourist spots on Belitung are found on the pristine beaches and offshore islands/islets. The main beaches are Tanjung Tinggi Beach and Tanjung Kelayang Beach, both of which boast blue clear water, powdery sands and the signature rocky landscape. As for the islands/islets, Batu Berlayar Island (meaning Sailing Rock) is full of stunning granite structures while Lengkuas Island is the home of a 129 year-old lighthouse and a great place for snorkeling. Pasir Island is made of sand and is submerged during high tide, as is Bird Islet (Pulau Burong) which can be accessed from Tanjung Binga beach at low tide. "Since 3 months of the operation Aston Belitung Hotel can be proud in concern into the occupancy number that always reached 70%, we are pleased to join to promote tourism in the Islands are also very happy and quite satisfied with the positive response given by the local community and local government” says Endi Basuki for General Manager Aston Belitung Hotel. “Belitung is a fantastic destination for both leisure and business travel thanks to its idyllic surroundings and growing commerce, so we are extremely proud to be bringing our Aston brand to this paradisal island. By introducing a hotel with high standards and quality accommodations, we hope to attract an international clientele to Belitung to support its economic development and exciting future prospects” says Norbert Vas, Archipelago's VP for Sales & Marketing. 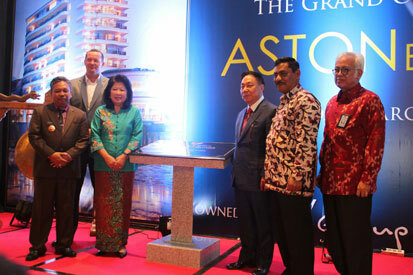 Grand Opening Aston Belitung Hotel, seen in the picture from left to right From the left Mr. H. Rustam Effendy (Governor of Bangka Belitung), Mr. John M Flood (President & CEO of Archipelago International), Mrs. Mari Elka Pangestu (Minister of Tourism and Creative Economy), Mr. DR Budiono Widodo (owner of Aston Belitung), Mr. H Sahani Saleh (Regent of Belitung), Mr. Firmansyah Rahim (Kemenparekraf) during the Soft Opening Ceremony. 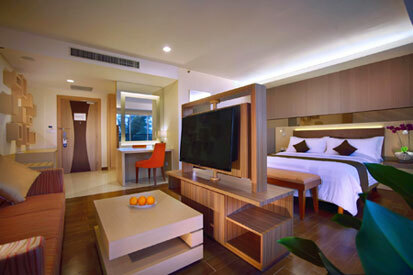 Suite Room Aston Belihtung Hotel – Belitung.